Professor Wogglebug’s Map of the Marvelous Land of Oz, attributed to L. Frank Baum. From: L. Frank Baum, Tik-Tok of Oz (Chicago, 1914). “This first printed map of the Marvelous Land of Oz presents its four counties in their official colors, but reverses the position of Munchkin and Winkie Counties. The inconsistency is also reflected by the map’s compass points, where East unusually is to the West, and West is to the East.” Credit: Houghton Library, Typ 970.14.1955 - Presented in honor of Dennis C. Marnon, 2018. A double-page copperplate map of a Portion of the Kingdom of Spain by Tomas Lopez. From: Miguel de Cervantes Saavedra, El Ingenioso Hildalgo Don Quixote de la Mancha (Madrid, 1780). “Their route is delineated in red; the numbers added along the way are keyed to thirty-five episodes listed in an elegant cartouche surmounted by loyal Panza and Quixote’s empty suit of armor.” Credit: Houghton Library, *SC6.C3375.B617d 1780 (B) - Gift of William Carmichael, 1782. Fold-out, hand-colored “Carte de Tendre,” attributed to François Chauveau. From: Madeleine de Scudéry, Clélie, histoire romaine (Paris, 1654). “Multiple suitors cause the novel’s heroine Clélie to create a Map of Love, originally conceived by de Scudéry as a society salon game. Three paths to spiritual love emanate from the city of New Friendship, leading in the west to Recognition, in the north to Esteem, and in the east to Inclination.” Credit: Houghton Library, *75-193 - Amy Lowell fund, 1975. The exhibition remains up through April 14. Professor Wogglebug's Map of the Marvelous Land of Oz, attributed to L. Frank Baum. From: L. Frank Baum, Tik-Tok of Oz (Chicago, 1914). 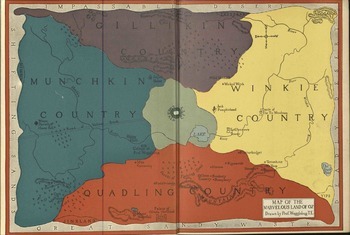 "This first printed map of the Marvelous Land of Oz presents its four counties in their official colors, but reverses the position of Munchkin and Winkie Counties. The inconsistency is also reflected by the map's compass points, where East unusually is to the West, and West is to the East." Credit: Houghton Library, Typ 970.14.1955 - Presented in honor of Dennis C. Marnon, 2018. A double-page copperplate map of a Portion of the Kingdom of Spain by Tomas Lopez. 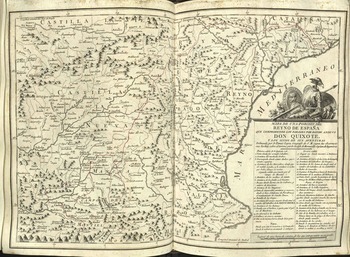 From: Miguel de Cervantes Saavedra, El Ingenioso Hildalgo Don Quixote de la Mancha (Madrid, 1780). "Their route is delineated in red; the numbers added along the way are keyed to thirty-five episodes listed in an elegant cartouche surmounted by loyal Panza and Quixote's empty suit of armor." Credit: Houghton Library, *SC6.C3375.B617d 1780 (B) - Gift of William Carmichael, 1782. 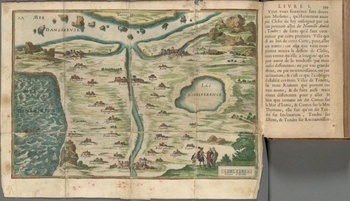 Fold-out, hand-colored "Carte de Tendre," attributed to François Chauveau. From: Madeleine de Scudéry, Clélie, histoire romaine (Paris, 1654). "Multiple suitors cause the novel's heroine Clélie to create a Map of Love, originally conceived by de Scudéry as a society salon game. Three paths to spiritual love emanate from the city of New Friendship, leading in the west to Recognition, in the north to Esteem, and in the east to Inclination." Credit: Houghton Library, *75-193 - Amy Lowell fund, 1975.